Which of your black and colour cartridges are suitable for the HP Envy 5530 printer? Will I be able to swap unopened cartridges I purchased in January '15 as I've had to purchase a new printer because of a fault with my original printer? The new printer is a HP Envy 120 series. Can you please email me as soon as possible? Yes, as long as the items are fully sealed and within our one year warranty period, then they can be returned for a refund or replacement. If you're able to confirm which cartridges you're returning, we can then arrange a return with a Freepost address to return these inks. For someone who would use the printer infrequently, how long would the HP Envy 120 ink maintain its quality? We advise that once the ink cartridges are opened and installed in your Photosmart Envy 120 e-All-in-One printer they will dry out quite quickly if the printer isn't used regularly. Therefore, we would advise you to print a test page at least once a week to keep the ink flowing freely through the cartridges. If the HP Photosmart 120 ink cartridges remain unopened we advise a 12 month shelf life, as with all of our ink cartridges, provided that they're stored in a cool, dry environment. Does the HP Envy 120 e-All-in-One printer scanner support compatible ink cartridges? Yes, we guarantee that our premium brand compatible HP Envy 120 e-All-in-One ink cartridges will work reliably in the machine or we'll give you your money back. We currently stock compatible HP 300XL ink cartridges which act as a direct replacement for the high capacity cartridges and should work in the same way as the original HP 300XL ink cartridges in your Photosmart Envy 120 printer. Home users can create vivid and crisp photos and documents with the HP Envy 120 e-All-in-One inkjet printer, a sleek multifunction device that boasts impressive print speeds, easy operation, and wireless connectivity. The HP Envy 120 e-All-in-One is convenient to use because of mobile printing capabilities, direct printing from memory cards, and a large colour touch panel, but it is expensive and has limited paper handling. PVC-free construction makes this elegant and compact device safer for humans and the environment. Apart from USB 2.0 connectivity, the HP Envy 120 e-All-in-One has built-in Wi-Fi and a memory card reader. It runs on 512MB of memory with paper capacity of up to 80 sheets and an output bin that can handle 25 sheets. The Envy 120 all-in-one weighs approximately eight kilograms and measures 13.3 inches tall, 19.5 inches deep, and 17 inches wide. This machine uses a tri-colour HP Envy 120 ink cartridge alongside the black ink. High capacity cartridges for the HP Envy 120 colour printer are also available. The print quality of the HP Envy 120e printer is very good, with timesaving features like two-sided printing, mobile printing, and Wi-Fi scan. 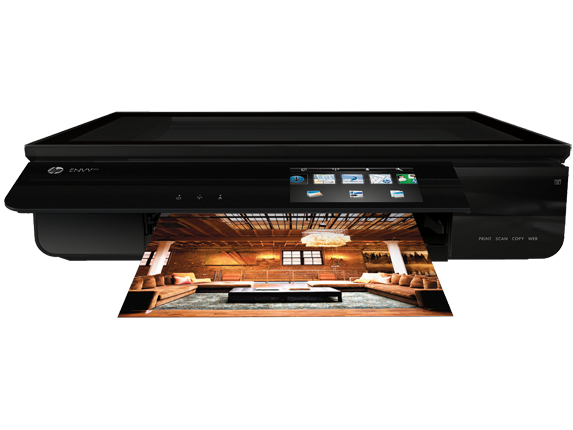 The HP Envy 120 is easy to operate and it supports AirPrint. The scans can be previewed from the see-through lid. The print speeds are up to 23ppm in colour and 28ppm in monochrome. The colour resolution is up to 4800x1200dpi for clearer and sharper images on a wide variety of paper types like transparencies and iron-on transfers. The Envy 120 colour inkjet printer has a built-in memory card reader that supports memory stick duo, multimedia card, and secure digital formats. The HP Envy 120 e-All-in-One is an expensive device. Users are required to register in the HP site before they can delete unwanted apps. Paper handling is limited, and both the paper capacity and memory are not expandable. The copier resolution of the Envy 120 e-All-in-One printer is only up to 600dpi, so very detailed graphics may look washed out.